"Pray and work" is an ancient motto of Benedictine order, and its rule ordered the monks strict abstention, obedience, intensive manual and mental labour. In times of existence (since VI century) Benedictine monasteries gave to the world a great number of scientists, writers, theologians and certainly, people talented in the applied sciences, in particular, brewers. Benedictines came to Germany from England as early as the VIII century aiming to strengthen the positions of Pope and Christianity. Later first monasteries of this order appeared. 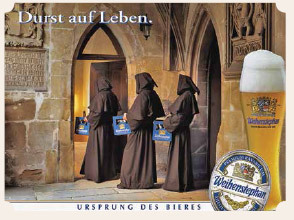 Combination of zeal with creativity allowed German monks to create recognizable tastes and first beer brands. And technological breakthrough that happened in brewing was what assisted it. Historians say that in early Middle Ages Benedictines first began to use hop for brewing beer regularly. Due to hop shelf-life of beer and, accordingly, geography of its deliveries grew. Now it became possible to try products of monastery outside the region where beer was brewed. 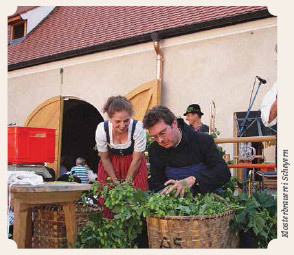 To a full degree the advantages of hop were used by brewers in the monasteries of Germany. Conservative Englishmen, rather successful by that time in technology of brewing, to the XV century treated hop with mistrust. Maybe that’s why today not English but German beer became a household name. Traditionally breweries at monasteries made special beer for sustenance of pilgrims. But that beer, which was generously given to the poor wanderers knocking at the doors of monasteries, could also become a source of income. The Benedictines, providing themselves independently, needed money. As monasteries had active economic and trade life, it is quite natural that having improved technology, they moved from production of beer for their own needs to providing with beer nearby villages and cities, and sometimes even the neighboring regions. So, according to the document of 1040, the authenticity of which isn't confirmed, the Benedictine bishop was given permission to sell beer brewed in the Weihenstephan monastery on the territory of the city of Freising. These permissions, as well as modern licenses, weren't free, but the brewery, apparently, was not at a loss. Because the company with the name Weihenstephaner is known today as the oldest operating brewery in Germany, though for a long time now it has belonged to the state and not to the Benedictines. Over time monasteries, paying heavy taxes and receiving preferences from local governors for it, began delivering more and more beer to the market and to build their own taverns, taking away a share of the market from craft brewers. Sometimes the discontent of beer guilds with rapid development of abbey breweries reached such levels that it resulted in revolts. Then the authorities even had to forbid monasteries to sell beer as it was done by the emperor Sigismund in the XV century. In Germany in 1803 the process of secularization began, that almost destroyed abbey brewing in its original look. Governors of the German states used weakening of Catholic Church during Napoleonic wars to nationalize its property. At that time there were about 350 abbey breweries in Bavaria alone. And all over Germany, by some estimates, about 500 breweries of various Catholic orders operated. Only some monasteries avoided loss of property or established contractual relations with new owners that allowed them to continue brewing beer. Thus, in the XIX century monasteries stopped playing any noticeable role at the German beer market, though left a huge trace in the history of brewing and in the memory of Germans.